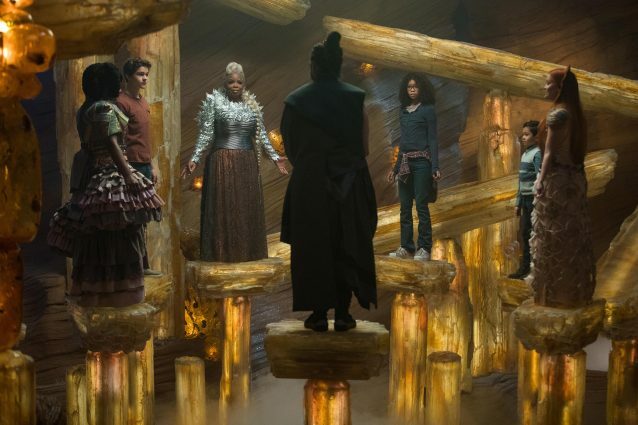 “A Wrinkle in Time” is a fun-filled adventure around the universe for viewers of all age groups. The director Ava DuVernay does a splendid job at depicting Madeleine L’Engle’s 1962 novel and bringing it to life on the big screen. The film begins with a scene where Dr. Alex Murry, played by Chris Pine, is speaking to his daughter Meg, played by Storm Reid, about getting ready to meet her new little brother and speaks heavily about love. Viewers are also introduced to Meg’s adopted younger brother Charles Wallace, played by Deric McCabe, an outspoken, intelligent and very loving individual. Everyone at school seems to think Meg is crazy because her father has been missing for 4 years, due to a supposed science experiment, yet she still holds on to the hope that possibly one day he will return. Things begin to take an unexpected turn when Charles brings a strange dressed woman into their house one night. The woman introduces herself as Mrs. Whatsit, played by Reese Witherspoon, and explains to Meg, Charles and their mom Dr. Kate Murry, played by Gugu Mbatha-Raw, that their father is out there and should be praised as opposed to being called crazy. Eventually the siblings are encountered by a boy from Meg’s school named Calvin, played by Levi Miller, who said that something had told him to go there. The three are then introduced to the other celestial beings Mrs. Who, played by Mindy Kaling, and Mrs. Which, played by Oprah Winfrey. The women explain their father is alive and they followed the path of his distress signal, which lead them to earth. Mrs. Which tells the children that they must embark on a journey to Camazotz, which is the land of darkness where their father is trapped. They soon learn both the beauty and dangers of the land they are about to travel through. The dynamic cast chosen did an amazing job. It was interesting to see them play roles that matched their character on and off the screen. Other appealing aspects of the film are the camera angles and shots that were chosen because they add to the emotion of the film. The scenery was beautiful and although most of it was shot in Los Angeles, the computer-generated imagery and green screen locations were magical. The themes in the film were interesting and refreshing because certain topics were brought up, such as having a half-sibling, being abandoned or being bullied. These are all issues that are part of life, which allows viewers to form a connection or bond to the characters. Although there is a lot of Disney magic, viewers are able to separate reality from fiction and understand the overall message being portrayed. Moviegoers are able to learn what it means to truly never give up, never lose hope and never lose love for a strong belief. For the most part the film was pretty accurate to the book, although some alterations were made to certain characters. One change that was noticeable was the addition of a mean girl named Veronica, played by Rowan Blanchard, and the deletion of Meg and Charles’ twin brothers, Sandy and Dennys. Another notable change was that in the book the celestial beings have been historically thought of as white, but in the film they are all different races. This changes the construction and norm of film, where a person’s race should match their character and is an innovative and interesting thing to see happen. “A Wrinkle in Time” seems to be a breath of fresh air, which steers away from the typical prince and princess Disney love story that moviegoers are used to. This film is rated PG for thematic elements and some peril.